Finally! An authoritative, comprehensive textbook in this commercially and academically important field. Billions of kilograms of polymers are manufactured annually in the form of polymer colloids. Thousands of researchers work with them in a host of applications, from water-borne latex paints to cancer chemotherapeutics, but until now there was been no adequate introductory text. This book provides a solid development of the fundamentals to the field of colloid science with a solid development of the fundamentals of polymer colloids, emulsion, polymerization, latex technology, and the applications of functional latexes in catalysis, medical diagnostics and therapeutics. Fitch, who has been called the Benjamin Spock of Polymer Colloids, bases his approach to a complex field is based on his 40+ years of experience in industrial and academic research and development. His approach makes it easy to understand and be able to work effectively in this fascinating field. 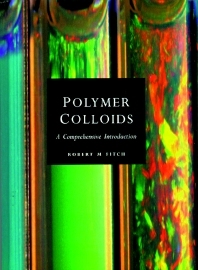 Students and professionals will find Polymer Colloids: A Comprehensive Introduction an important resource in gaining a working understanding of polymer colloids, enabling them to carry out their own research and/or development. Graduate and senior undergraduate students. Chpt.1-Introduction. Chpt.2-Emulsion polymerization. Chpt.3-Practical applications of emulsion polymerization. Chpt.4-Nonaqueous dispersions Chpt.5-Characterization of polymer colloids Chpt.6-Chemistry at the interface. Chpt.7-Latex stability. Chpt.8-Electrolkinetics Chpt.9-Order-disorder phenomna. Chpt.10-Rheology of polymer colloids. Chpt.11-Film formation. Robert M. Fitch has spent over 40 years working with polymer colloids as a professor of Chemistry and in industry. With a ChemistryPh.D. from the University of Michigan, he is the author of over 100scientific papers, patents and is editor of two books on polymer colloids.Retired as Chief Scientific Officer Worldwide of SC Johnson Wax, he is nowa consultant.